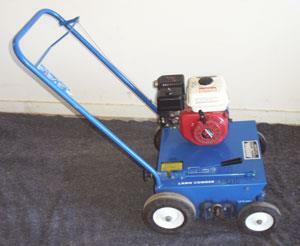 5 hp gas powered power rake. For removing thatch from existing lawns. Uses flail blades to scratch the ground surface to lift dead thatch to the tip so it can be easily picked up. Does not damage the existing grass. Folding handle for easy transporting.